1 of 3 Place onion and olive oil into a deep 4-quart covered microwave-safe dish. Microwave on HIGH, uncovered, for 4 minutes. Stir in rice, chicken broth, salt, nutmeg and cayenne. Cover and microwave on HIGH for 10 minutes. 2 of 3 Stir in chicken and microwave, covered, for an additional 10 minutes. 3 of 3 Stir in artichokes and let stand, covered, for 10 minutes. Stir in butter, cheese and basil. Serve. 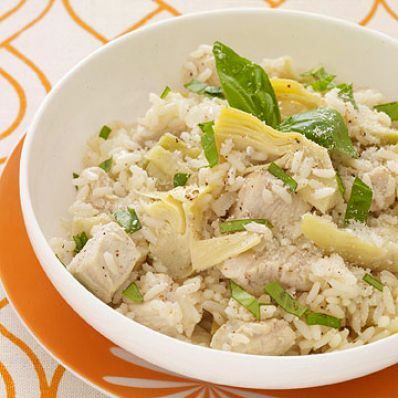 Nutrition Information for Chicken and Artichoke "Risotto"
Per Serving: 942 mg sodium, 2 g fiber, 379 kcal cal., 39 g carb., 25 g pro., 13 g Fat, total, 5 g sat. fat, 60 mg chol.